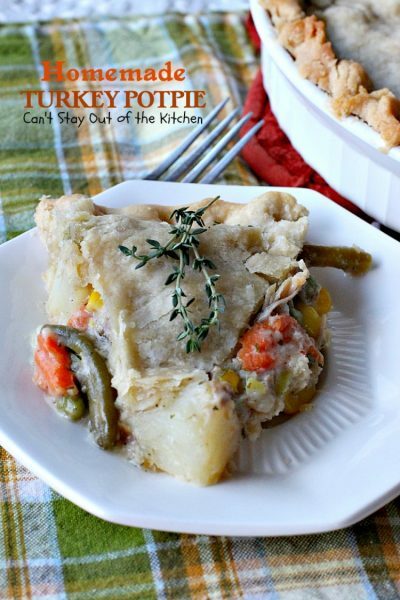 Homemade Turkey Potpie is one of the B-E-S-T potpie recipes you’ll ever eat! It is so succulent and amazing that even though this recipe makes three large potpies, you may find you want to eat all of them rather than freeze a couple of them for later! Back in August I saw this fabulous recipe and now I’ve finally gotten around to making it. Oh, my! It was spectacular. 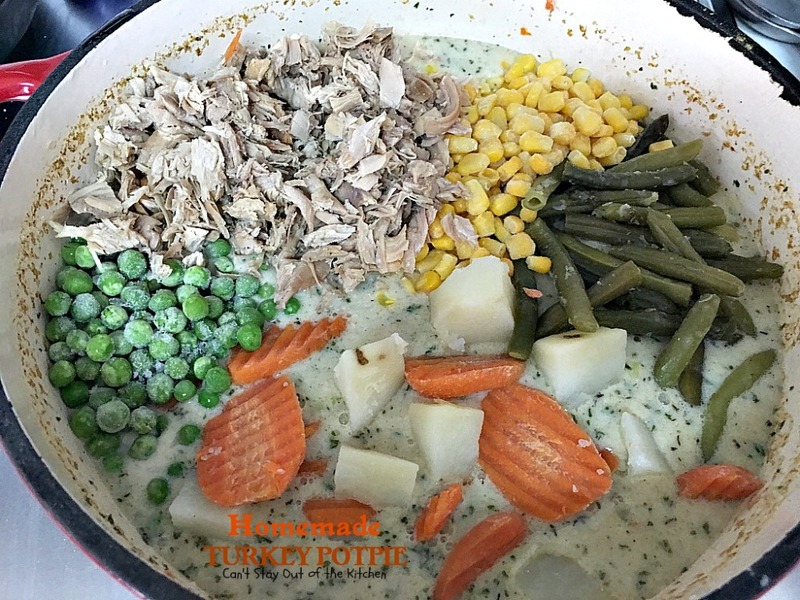 Lots of turkey, peas, corn, beans, and carrots in a delicious sauce with thyme and parsley. I loved this recipe. And, when I took it to a potluck everyone who had a bite of it loved it too. It’s a really special recipe. I highly recommend it. 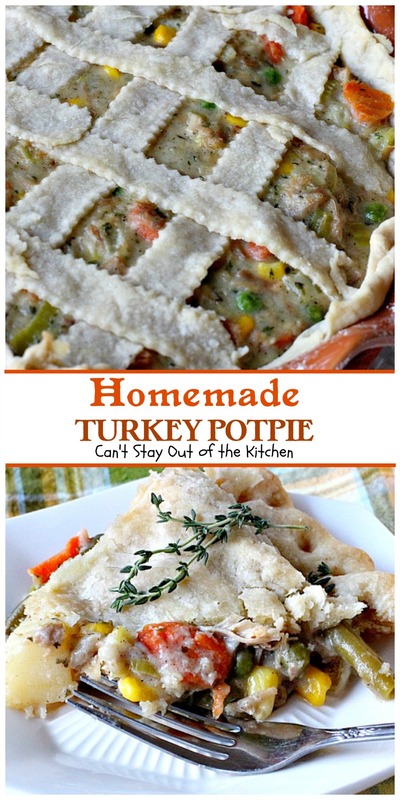 Our family loves pot pies — chicken, turkey, beef, or pork — we love them all. This one has a particularly tasty sauce that makes it quite outstanding in flavor and texture. Having a double crust rather than just a top crust is really nice. This is also a fabulous way to use up leftover turkey or rotisserie chicken. We really enjoyed this recipe, and I think you will be pleased by this recipe too. This recipe is inspired from Two Southern Sweeties when they published it last August. 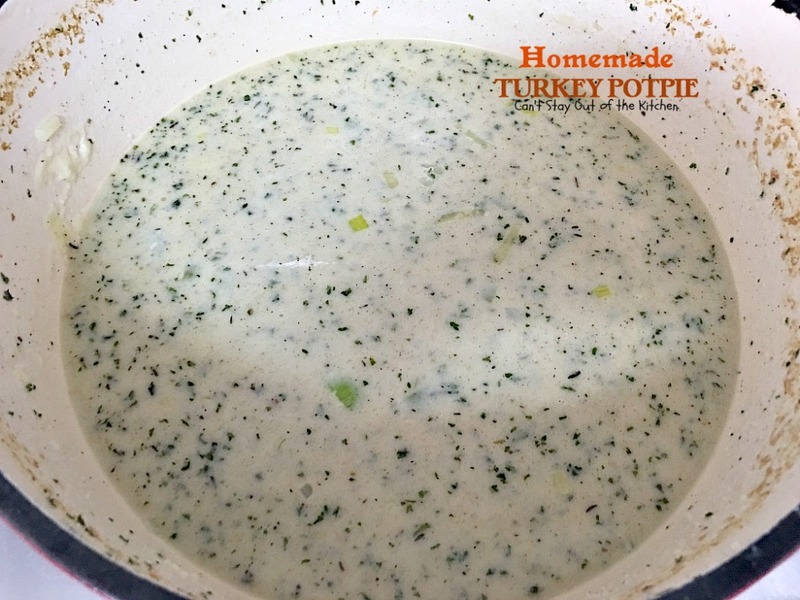 I have changed the recipe quite a bit adding additional veggies, changing out half-and-half and cream for 2% milk, and increasing the parsley and thyme. 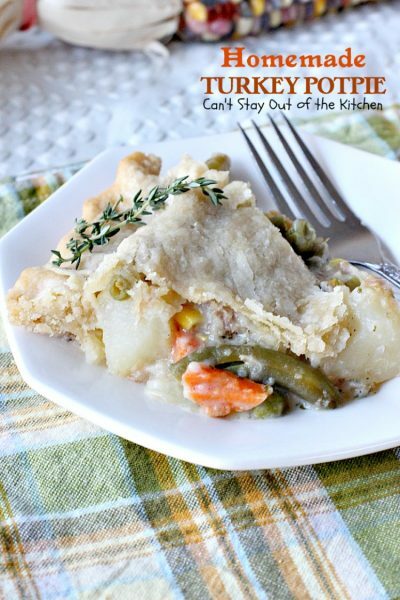 I always make this potpie with my Mom’s Homemade Pie Crust that’s flaky and wonderful. 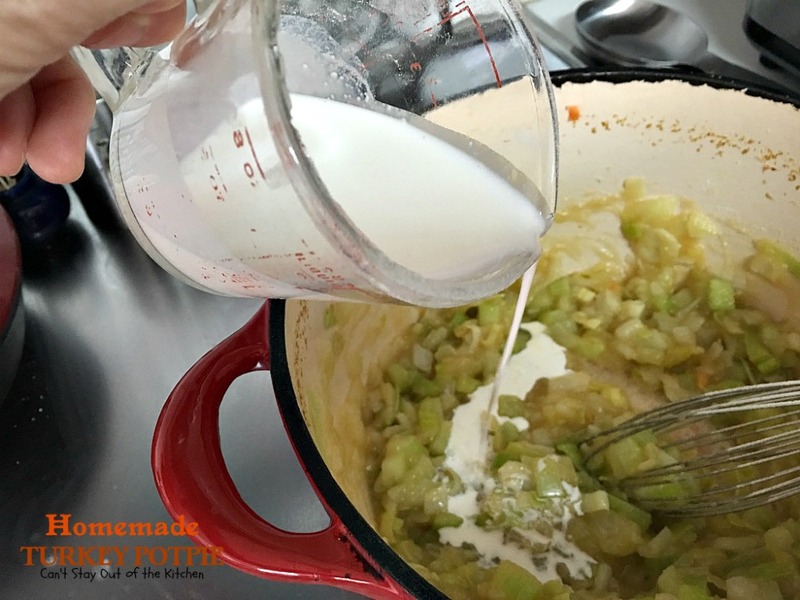 This makes a lot of potpie filling–enough to make 3 extra-large double-crust 10-inch deep dish pies. It’s a great recipe to prepare up to the baking point and then put two of the pies in the freezer for later. Then defrost and bake them like the original recipe states. Or, if you have friends or family in need of a meal, almost everyone enjoys potpies. This one is certainly one of the best I’ve ever eaten. When I initially published this recipe in December 2012, I was still using an iPhone for a camera. Plus most of the pictures were taken in a building with high ceilings and fluorescent lights so the pictures did not turn out very well. 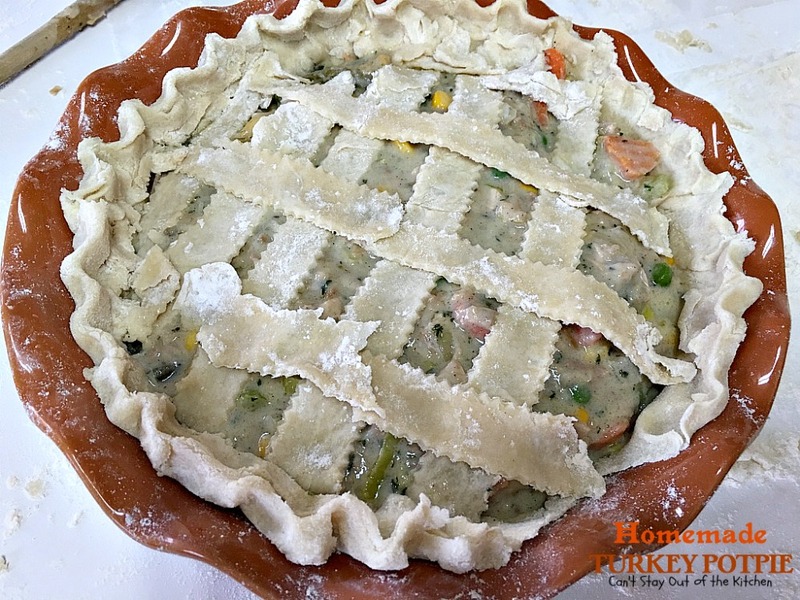 I recently remade this fabulous potpie after Christmas (2015) since I had leftover turkey. I kept one pie for us, gave one 9×13″ pie to folks I was taking a meal to, and then when I still had enough ingredients for a third pie (albeit with a lattice crust instead of a full top crust), I took that to a friend who had a house full of kids and grandkids but had wrenched her back. Everyone loved this pie. I did increase the seasonings this time. 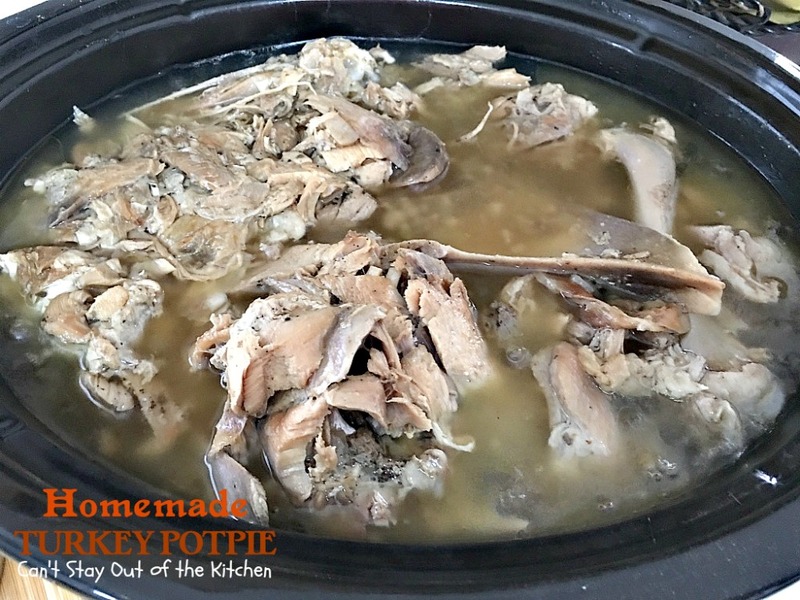 I cooked off a turkey carcass and used meat from the carcass and the homemade turkey broth. I also used some leftover veggies from Christmas dinner rather than using fresh or frozen veggies. Those worked just as well. So this is also a great pie that you can use leftover meats and veggies in, and the basic recipe works superbly. 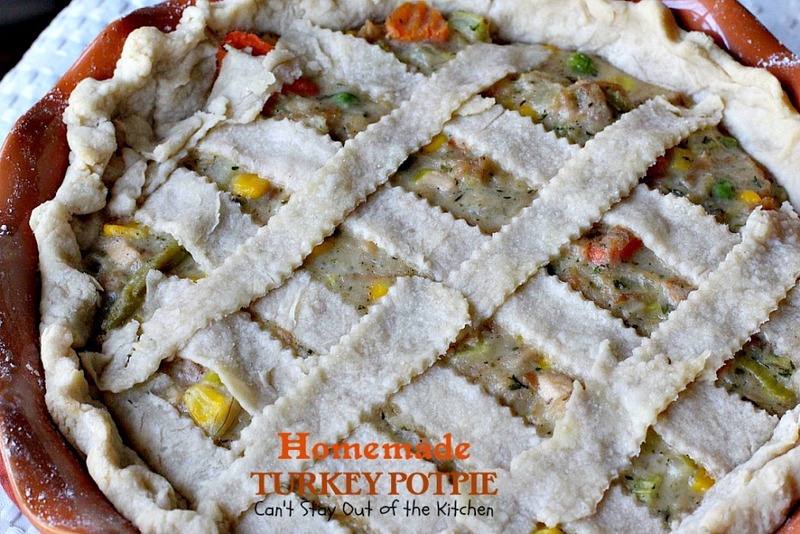 Homemade Turkey Potpie is sumptuous and amazing! 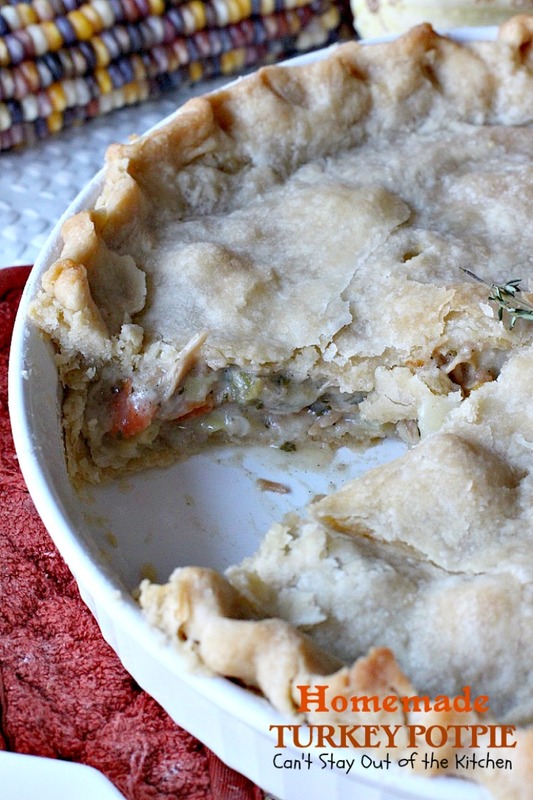 This potpie is seasoned to perfection with thyme and parsley. The thick filling is amazing. I made one potpie in a large 9×13″ deep dish foil pan that I used to take a meal to a family in. Then I made two more potpies in 10-inch deep dish pie plates. The third pie only had enough crust left for a lattice crust, but it was delicious that way, too. I used these ingredients. The green bowl contains homemade turkey broth, the white bowl contains deboned turkey. I actually ended up using leftover carrots and green beans in this recipe. It works very well with leftovers. I cooked the turkey carcass off in my crockpot over night. Fill the crockpot with water and salt and pepper generously. After cooking, carefully debone the turkey. Pour off the broth and strain it. Set aside. Wash, peel, and cube potatoes. 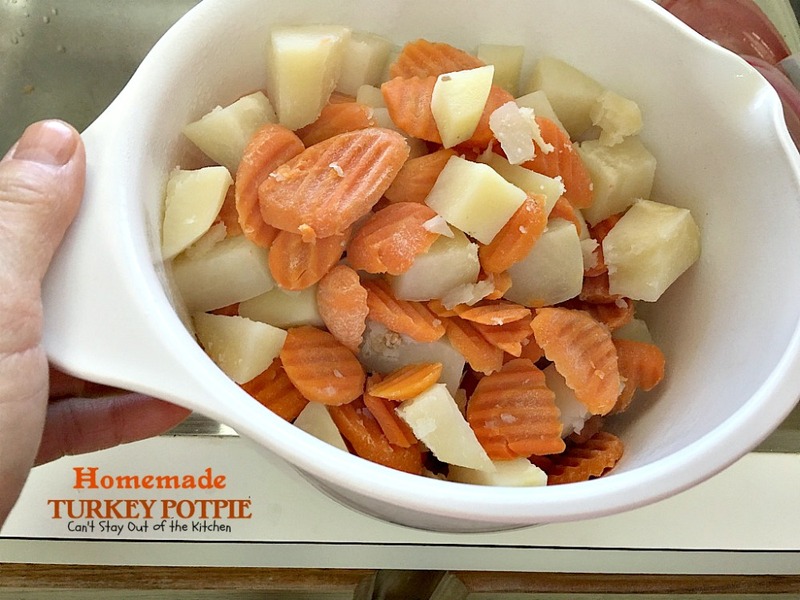 Bring potatoes and carrots to a boil and cook until still firm. Maybe 10 minutes or so. Drain and pour into a mixing bowl. Meanwhile, place butter in Dutch oven. 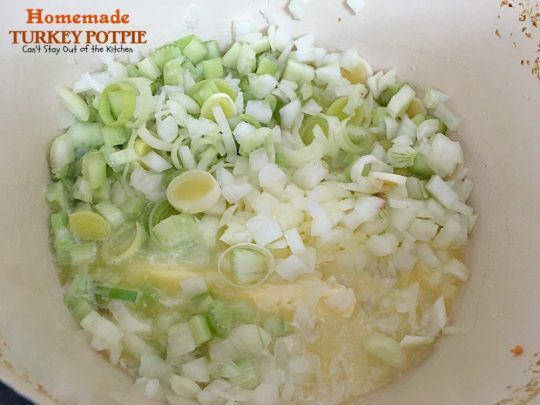 Add diced onion, leeks and celery and saute. Add flour. Whisk flour into butter and onion mixture. Slowly begin adding cream or half-and-half to mixture. Whisk in about a quarter cup at a time until worked into all the flour mixture. 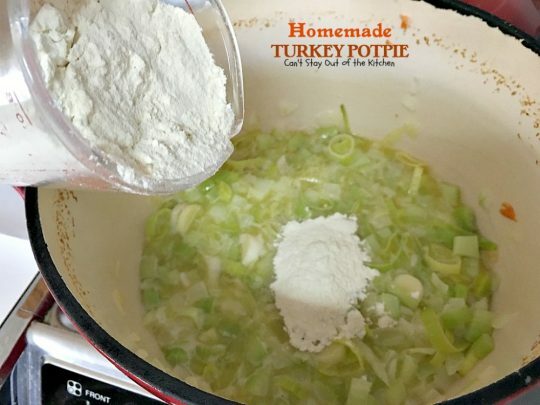 Continue adding cream until all of it is incorporated into the flour mixture. The mixture will be thick. Add seasonings: salt, pepper, thyme and parsley. Add turkey broth about one-quarter cup at a time until all is incorporated into the sauce mixture. Here’s what the sauce looks like after incorporating all the cream and broth into the sauce. 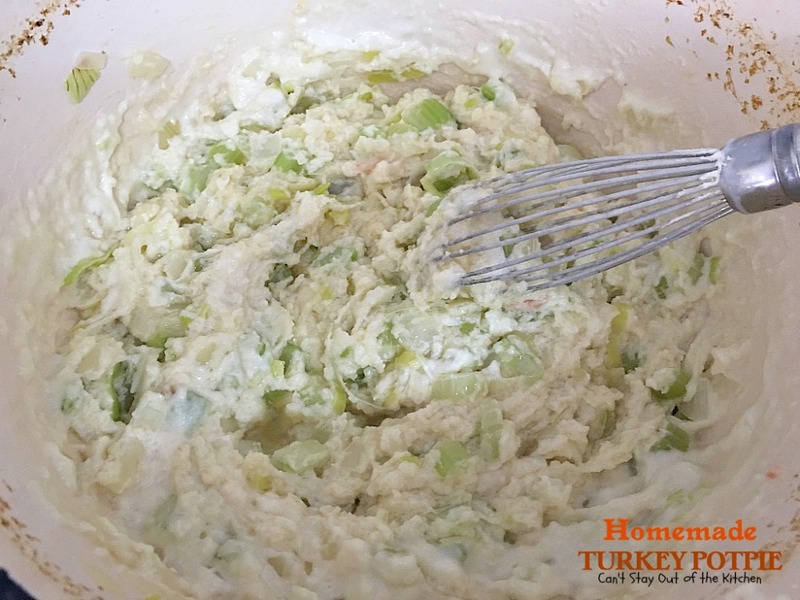 Add turkey, peas, corn, green beans, cooked potatoes and carrots. Place filling mixture in unbaked pie shell. Cover with top crust. Flute edges and add about 6 slits in the crust so steam can escape. Here’s the one with the lattice crust. You can see it was about all the crust I had left because I used a lot for the 9×13″ pan. Bake at 300 until done. The two round pies took 45 minutes to an hour and the large 9×13″ dish took about an hour and a half. I ended up tenting the pies with foil the last half hour or so in order to prevent them from getting brown. 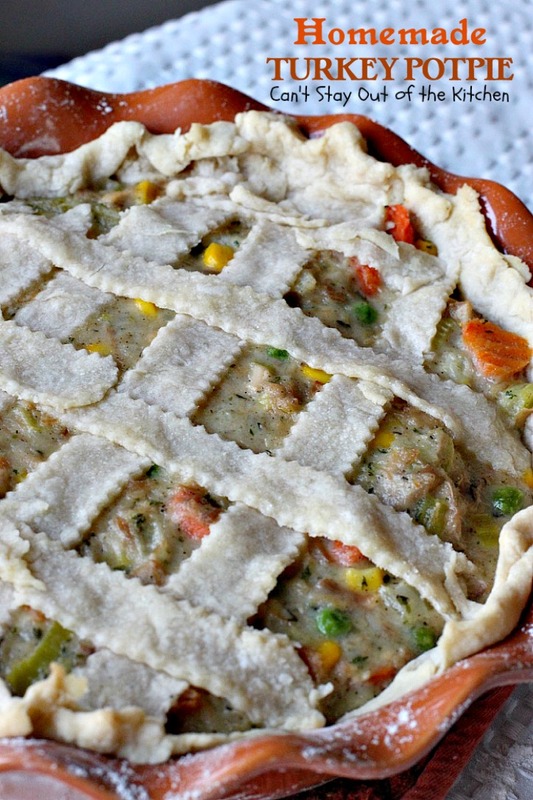 The lattice crust on this potpie allows you to see how thick the filling is. It’s so scrumptious and tasty you will be salivating over every bite! Homemade Turkey Potpie is one fantastic dinner pie. 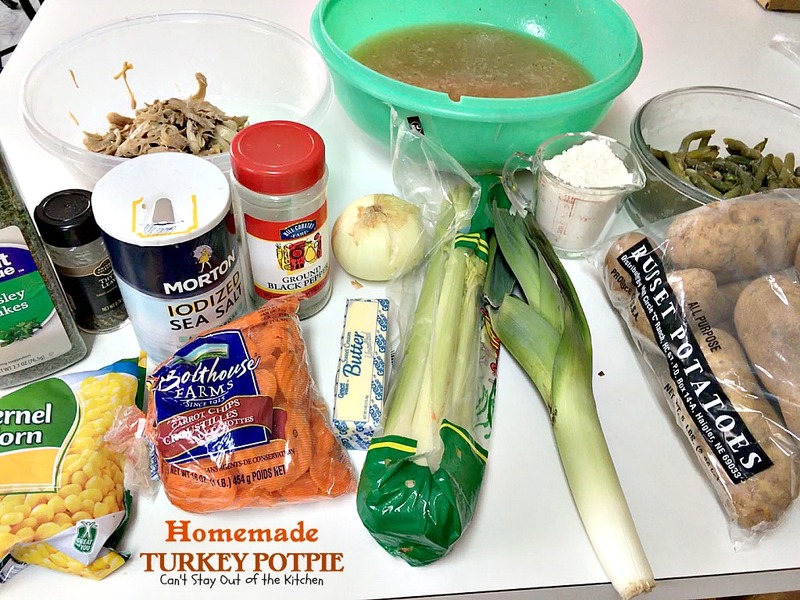 It’s a great way to use up leftover turkey, rotisserie chicken or even leftover veggies. Succulent and amazing turkey pot pie with corn, green beans, carrots, onions and potatoes in a deliciously seasoned sauce. One of the best potpie recipes you'll ever taste! Prepare double crust recipe for three 9" or 10” pies. Place potatoes and carrots into water and cook until still firm, approximately 10 minutes. In a large Dutch oven melt the butter. Add onions, leek and celery and sauté till tender. Add the flour a little at a time to the butter and onion mixture. Stir and cook for a few minutes to incorporate into the butter mixture. Slowly add the milk or cream about a quarter cup at a time to the pan. Then work the turkey broth into the pan the same way. 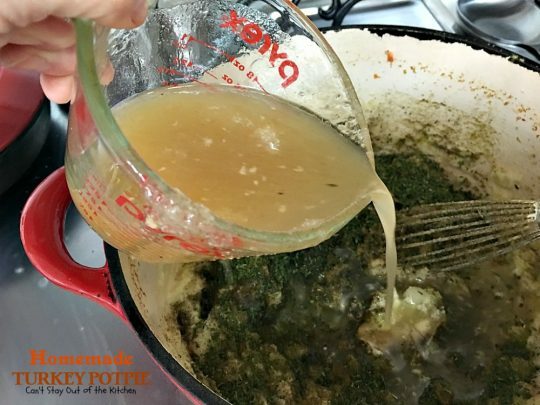 Keep stirring until milk and broth are fully incorporated into the flour/butter mixture. Add salt, pepper, thyme and parsley. Mix in vegetables, potatoes and chopped turkey. Place your three bottom pie crusts into three 10-inch deep dish pie pans. Divide the mixture evenly among the three prepared pie pans. 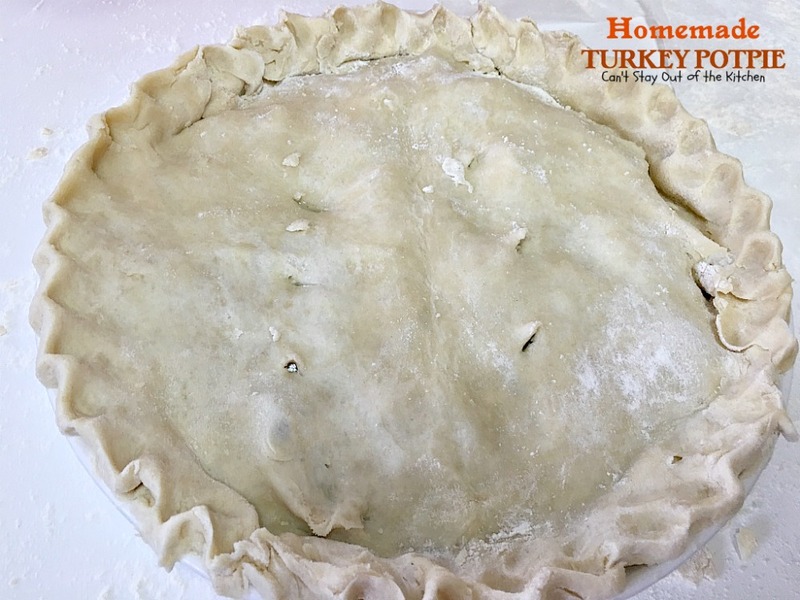 Gently lay the top crust on and press down around the edges to seal. Roll the edges under and press them a bit harder to ensure they are sealed. Cut a few slits in the top pie crust to allow steam to escape while cooking. Bake at 300° about 45 minutes to an hour. For large oval or 9x13” baking dishes bake about 1 ½ to 2 hours or until done. If pie crust starts to brown, tent with foil to prevent burning or scorching. Let stand for 15 minutes before cutting it. Each pie yields 6 servings. NOTE: Preparation time does not include time required to roll out pie crust or flute edges. NOTE: If you want to freeze one or two of the pies, cover the pie(s) tightly with foil before baking and freeze for up to 3 months. Thaw and bake about 45 minutes to an hour at 300. Recipe inspired from Two Southern Sweeties. 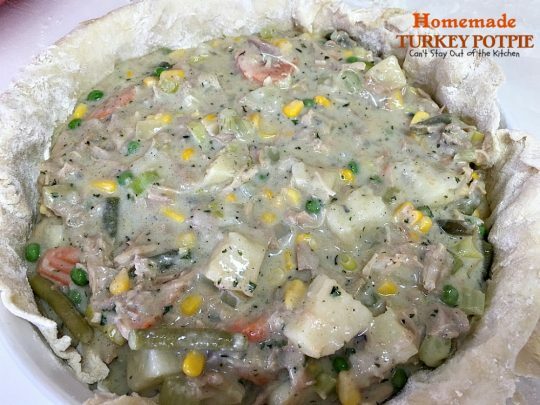 Succulent and amazing turkey pot pie with corn, green beans, carrots, onions and potatoes in a deliciously seasoned sauce. 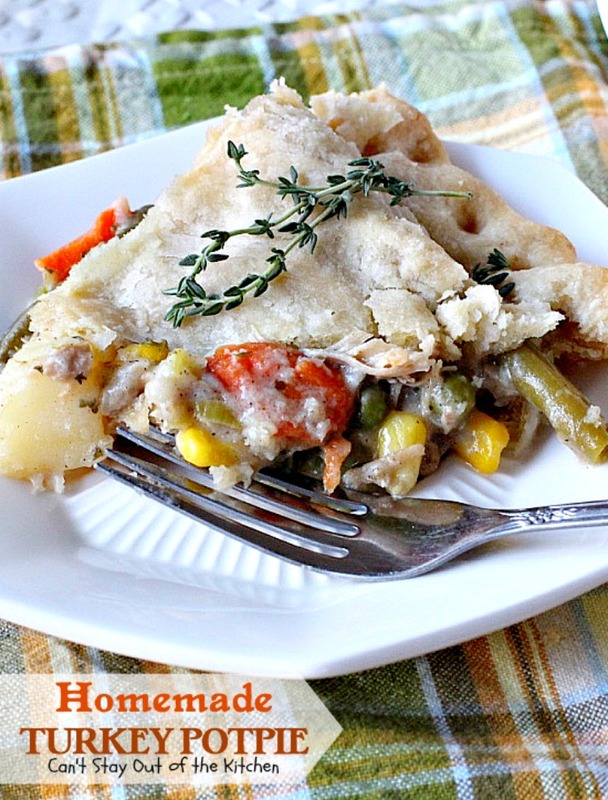 One of the best potpie recipes you’ll ever taste! Prepare [url href=”http://cantstayoutofthekitchen.com/2012/12/05/homemade-pie-crust/” target=”_blank”]double crust[/url] recipe for three 9” pies. For large oval or 9×13” baking dishes bake about 1 ½ to 2 hours or until done. Preparation time does not include time required to roll out pie crust or flute edges. [br][br]If you want to freeze one or two of the pies, cover the pie(s) tightly with foil before baking and freeze for up to 3 months. Thaw and bake about 45 minutes to an hour at 300. 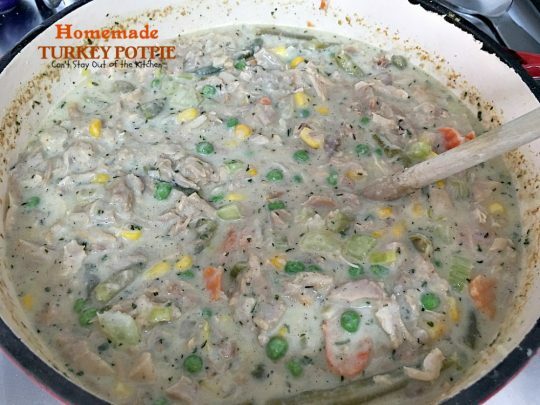 Homemade Turkey Potpie is chocked full of veggies and turkey in a delicious sauce. Homemade Turkey Potpie is a great recipe to make for company. Everyone raves over this potpie. I’m so glad that you and your family enjoyed this recipe. It is one of my all time favorites and a huge hit!!! Yes we loved it. 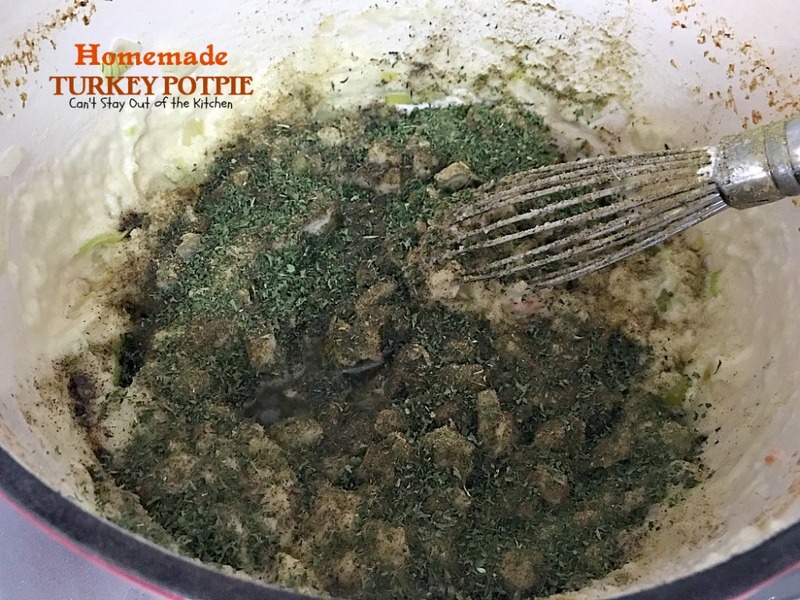 I need to pull out the recipe and make it again this year after turkey day! It was so amazing. We loved this recipe. This recipe looks tasty! I`m planning to make potpies with leftover Christmas turkey and freeze some – can`t wait! 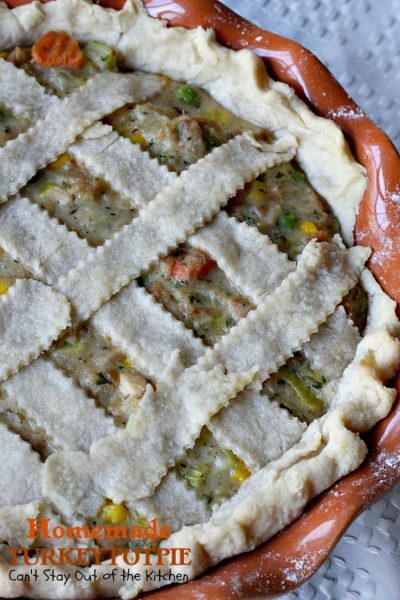 This is really a great recipe even if you don’t make your own pie crust. Do you ever partially bake the bottom crust before adding the filling? Does the bottom crust get soggy? I have never done that but I think the crust would then get really hard and tough if you tried pre-baking or partially baking the crust. You are far better off to go ahead and fill the crust, place on the top crust and freeze the pie – even if it’s just overnight – then bake it. 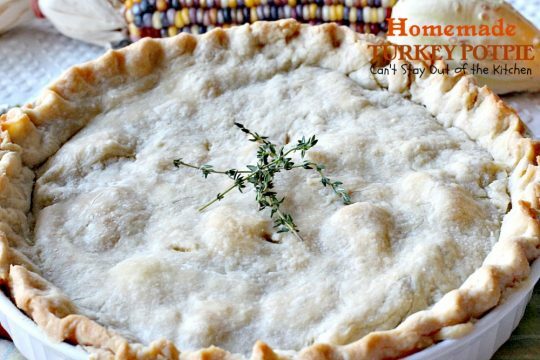 Just don’t let it sit thawed in your refrigerator for a couple of days or the same problem will occur – soggy crust!